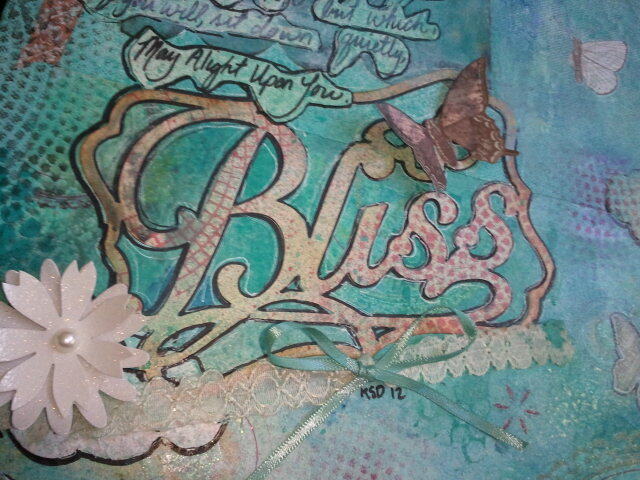 Last night, I sat down and began working on a new 11x14 canvas, that I named Butterfly Bliss. The first thing I did was put down some scraps from the blue paper bin. 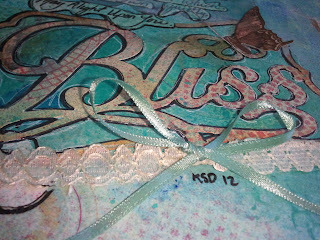 Next, I painted a border on using Master's Touch Acrylic in Ocean Green. I used a cloud stencil and modeling paste to make the clouds. 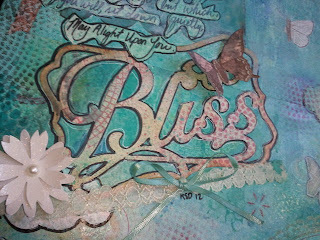 Then, I took a stencil and misted on some teal, black, and red. 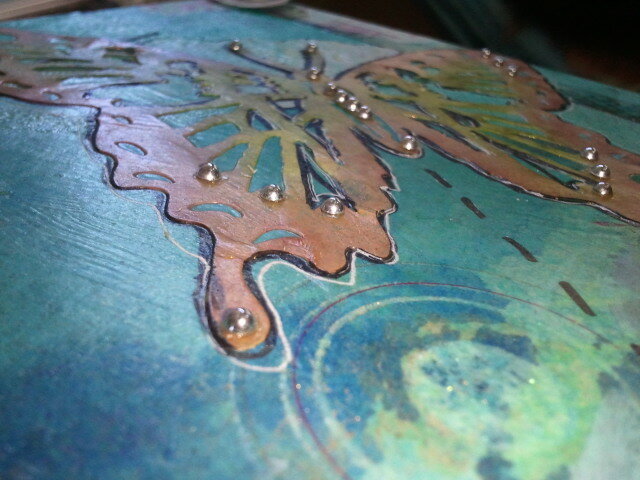 Some of the butterflies are Bo-bunny rubons. 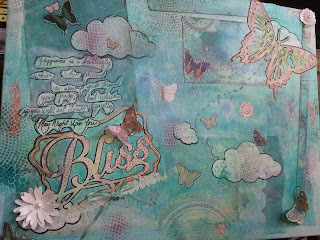 Now, I took the bliss embellishment and sprayed it with some red mists, and distressed the outside of it with Vintage Photo. 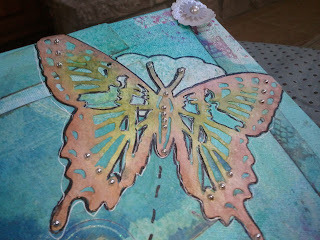 I added the butterfly and the white flower on the embellishment, both by K&Company. 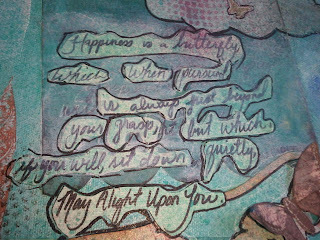 Next, I wrote this quote by Nathaniel Hawthorne on card stock, cut it out and adhered it to the canvas. This guy here is from K&Company. 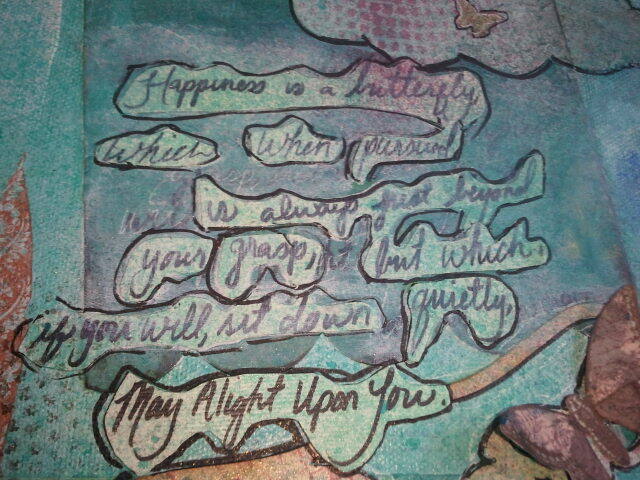 It was origanally a cream color, but I used my distress inks, Victorian Velvet and Peeled Paint. 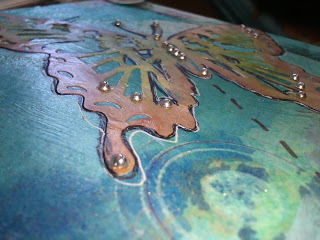 Look at the bling I added to the wings! 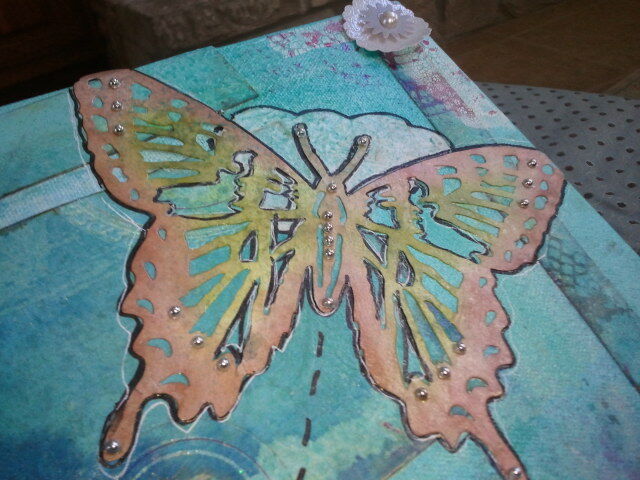 I also added bling to some other butterflys. I had a lot of fun with this canvas, and I tried not to be too serious about it, I just wanted to enjoy it! Beautiful canvas! Nice colors and great details! Thanks for joining us at 3 Girl Jam! This is so beautiful! You did a fabulous job on the butterfly. Thanks for linking up with 3 Girl JAM! This is beautiful!! 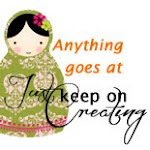 Thanks for sharing with us over at 3 Girl Jam!! Your project is just beautiful! Love all the artsy colors! Thanks for joining us at 3GJ! Wonderful! Thanks for joining 3 Girl JAM! I love this. 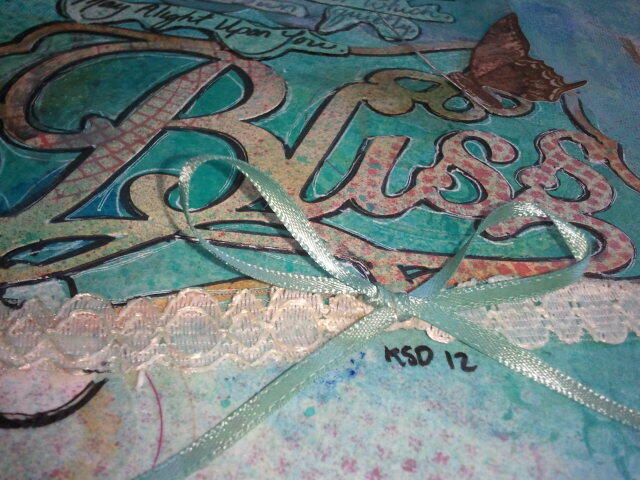 Gorgeous hues of blues and creams. Wonderful job on the sentiment. Thanks for participating in the 3 Girl JAM Challenge with us! Very stunning card! Love all the movement! Thanks for playing along at 3GJ! !